Bedwetting is a problem that has affected millions of children. Every night they sleep in suspicion of wet bed. Bedwetting also known as Nocturnal Enuresis is most common in infants and young kids. It’s a common sleep problem and most of the time it goes away without any medication or treatment, still, it is difficult to deny the fact that enuresis could lead to psychological and social imbalance in children. Parents get upset and distressed over their child’s bedwetting problem, especially, when the child gets older and he or she has to spend some night outside their house, in a camp or a friend’s place. It not only gives worries and sleepless nights to the parents but also to the child a disturbed social life engulfed in digresses and embarrassment. 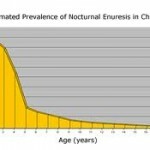 Situation of Enuresis is involuntary, and may happen even at daytime. It is an unwanted urination either in daytime of at night in people older than 5 years and has gained bladder control. Bedwetting is specific kind of enuresis (Nocturnal enuresis) that occurs mostly when the child is in his or her deep sleep. A few children accidentally wet bed occasionally and this should be taken normally. You should not worry a lot about such accidental situations. Bedwetting is common till the age of 6 years. Around 10 percent of six year-old may wet the bed occasionally. You should especially worry when it still continues till adolescents. Bedwetting is more common in boys than in girls. Nocturnal enuresis is twice as common in buys as in girls. That fact has been supported by many studies but still experts are not sure how gender difference matters in the problem of Nocturnal enuresis. According to the University of Alabama, girl child develops bladder control earlier than boys. Bedwetting may happen due to improper link between brain and bladder and as girls mature faster, they outgrow it earlier than boys and that remains unnoticed. However, gender affects the situation but as a parent you should reassure you child, whatever boy or girl, that it is not their fault. It is a common problem found in most children in their age group. It is not only the immature bladder muscles that causes bed wetting. Bedwetting is also found in adults. About 1 out of 100 adults consult doctors for their problem. Adult bedwetting is considered as secondary nocturnal enuresis. This is not a case of immature bladder so bedwetting in adults may occur due to variety of things including sleep apnea, heavy sleeping, stress, chronic constipation, prostate obstruction, urinary infection, diabetes or other physical and emotional conditions. If you are one of those adults having bedwetting problem, instead of limiting your life you should immediately consult a doctor for night-time incontinence.